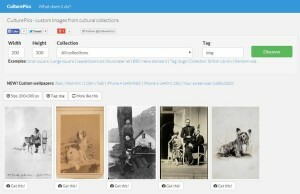 A few weeks ago I undertook a quick challenge to come up with something to show how cultural collection APIs could be used to very quickly deliver simple tools aimed at reaching far beyond typical audiences, especially in the creative sector. Without much time to spare it had to be simple, so my idea was a placeholder image service somewhat like placehold.it or placekittens.com. I chose Flickr Commons and Europeana APIs, though the idea could easily be extended to any image collection accessible via an API. The development process was simple: ingest the image metadata via the APIs; create a basic script using ImageMagick which resizes images to custom dimensions; configure powerful but simple Apache redirects and regex so that images can be served up using clean urls based on a standard syntax; and finally wrap all this in a clean and easy user interface that works well on both desktop and mobile devices. And so culturepics.org was born. What is interesting is how things like the simple tag search has actually proved to be a useful cross-collection discovery tool, and how it has opened up other ideas like custom e-cards.